Cottontails Baby: New LOWER PRICES across the board at Cottontails! 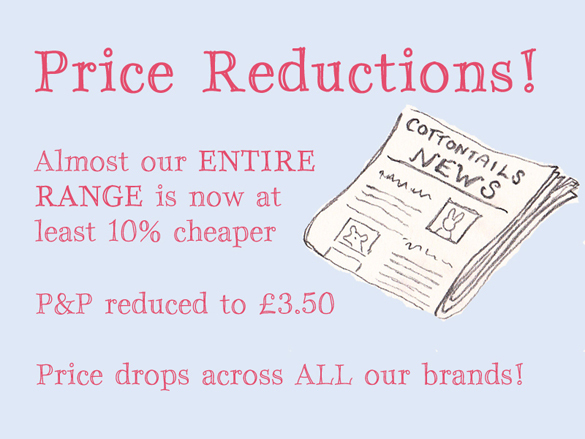 New LOWER PRICES across the board at Cottontails! 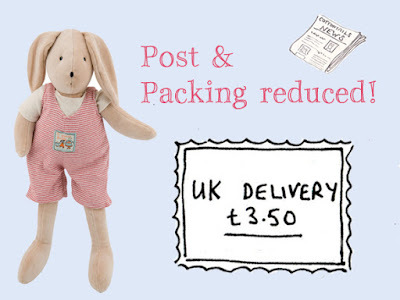 Online retailing has changed enormously in the thirteen years I've been running Cottontails. There is now far, far more competition and many more shops selling way below RRP. In the past I've relied on a lovely brand, a comprehensive range and good old fashioned customer service to carry Cottontails, but it's been a bruising couple of years and it's time for me to get a little more business savvy if I'm to compete in this evermore more cut-throat market place. So, time for a few changes... LOWER prices, REDUCED delivery charges, but of course the same trustworthy, friendly, personal service! Although I've only ever sold things at the RRP, there are now so many competitors consistently undercutting the guide price that I simply have to join in the game. So I've combed through item by item and cut prices to a bare minimum. 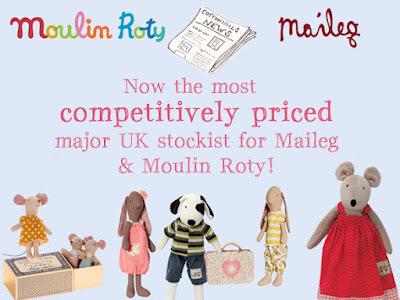 Almost everything has dropped by at least 10%, and I think this makes me the most competitively priced major retailer for Moulin Roty and Maileg in the UK. I'm pretty chuffed with this and hope you will be too! A new LOWER delivery charge! 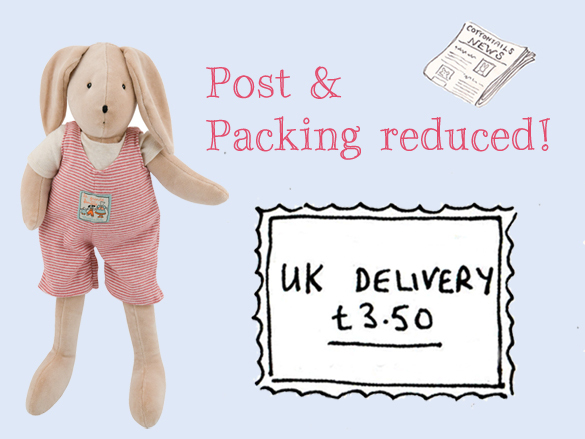 I have reduced the delivery charge by nearly 25% - so standard UK delivery is now just £3.50. And don’t worry there are still options to upgrade to an express service if your order is urgent. 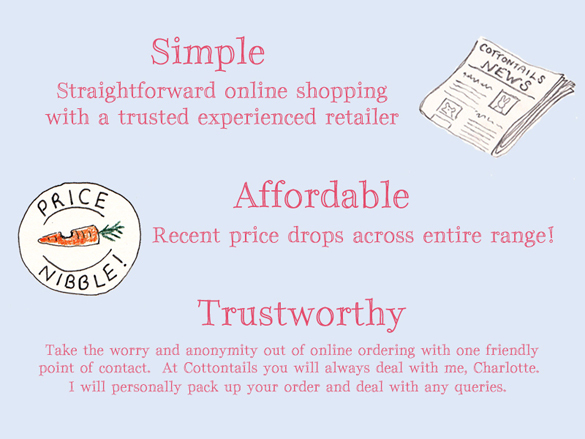 As ever, when you order from Cottontails you are dealing with just one person… me! I will process your order from start to finish, from the moment the email pings into my inbox, through to the drive to the post office to get your parcel on its way. This means if there is an issue with your order, I will pick up on it and personally let you know. And if something disappears in the post or gets damaged– because these things happen – I will always sort things out for you. 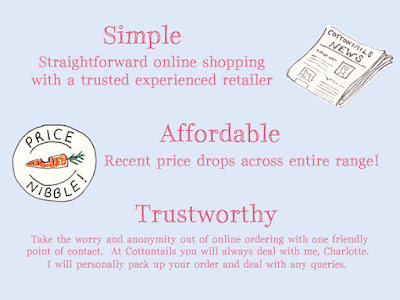 When you order from Cottontails you can relax – because a real person takes ownership of your order and makes sure you are happy. 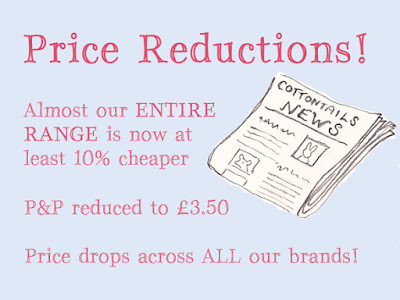 So, all in all, I hope that with the keen new pricing and the lovely old customer service, Cottontails will be hopping into a brighter future... Please hop and shop with us!